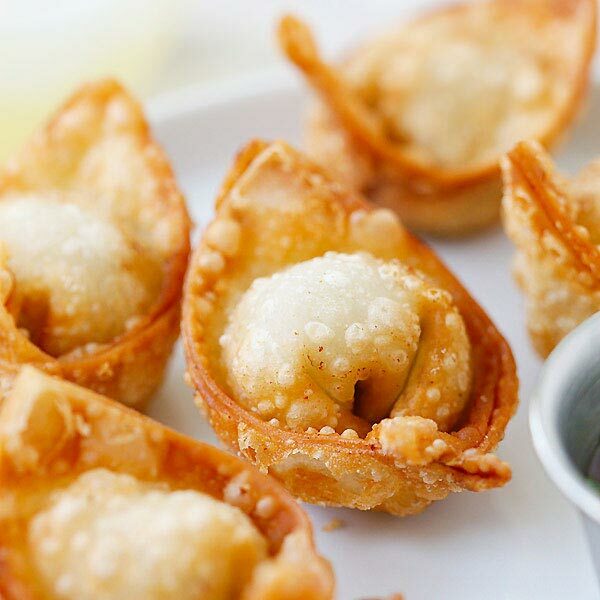 Fried wontons – Homemade, crispy and delicious wontons with simple everyday ingredients. Learn how to make wontons with this easy Chinese recipe. Wonton is a type of Chinese dumpling. 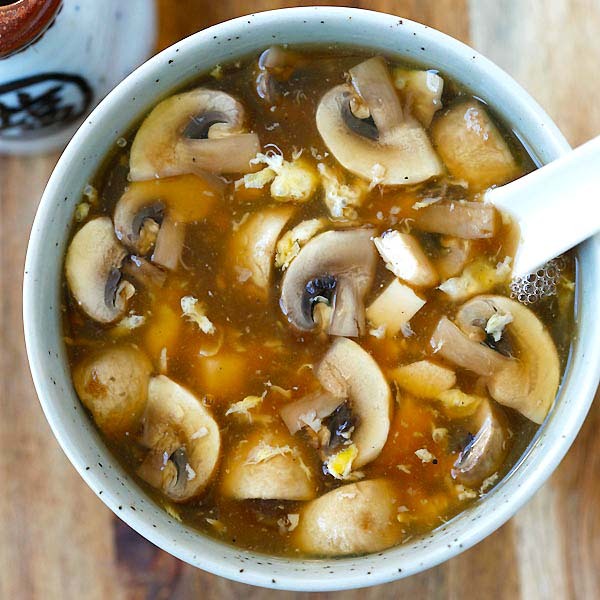 They come in small parcels and are available in many forms: steamed, deep-fried or in soup. What is inside of a wonton? The inside contains a savory meat or seafood filling and a special yellow color and rectangle wrapper wraps the filling inside a wonton. The yellow color comes from egg yolk as wonton wrappers do contain eggs. 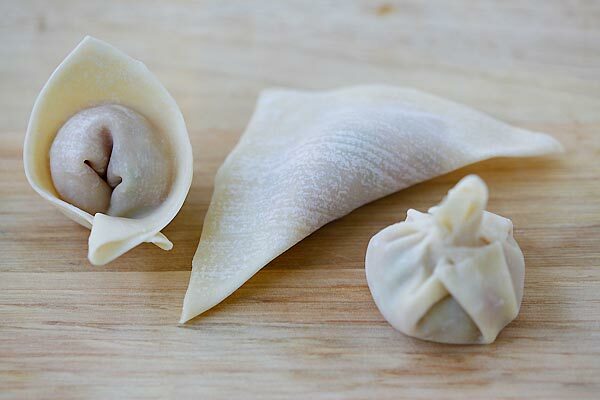 Many people are wondering what is the difference between a wonton and a dumpling? Simply put, wontons are dumplings. They are under the big umbrella of Chinese dumplings and they are a subset of dumplings. Fried wontons are deep-fried to golden brown and popular in the Chinese restaurants here in the United States. They are an appetizer and come with a pinkish-red Chinese sweet and sour dipping sauce. 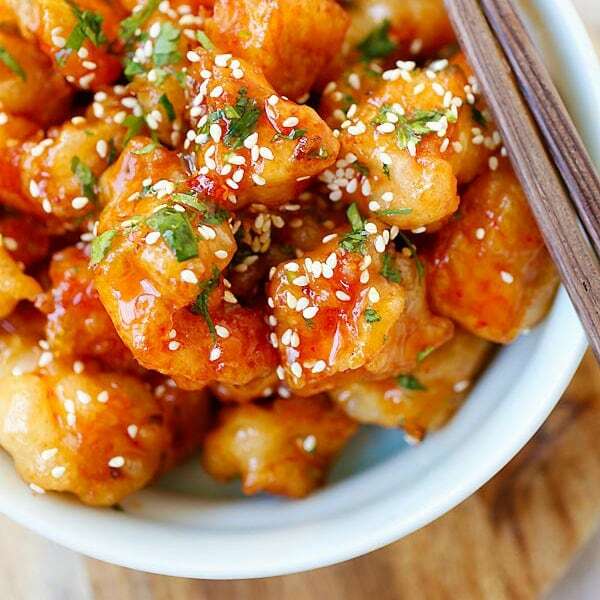 Everyone loves them because they are so crispy, delicious and the sweet and sour sauce makes them even more appetizing. Once you start eating, you just can’t stop! My wontons recipe is very easy take less than 30 minutes to make at home. First of all, you make the filling. My recipe calls for a shrimp with ground pork filling. I added some water chestnuts for an extra crunch and texture. You can also use chicken or turkey as the filling. You may add in some shrimp, scallop or crab if you like. Next, you need to learn the basic technique of how to wrap Chinese dumplings by watching the video above. To deep-fry, make sure you use a neutral cooking oil such as vegetable oil. After deep-frying, make sure you drain the excess oil with paper towels. What Dishes to Serve with this Recipe? This meal is best served as an appetizer. 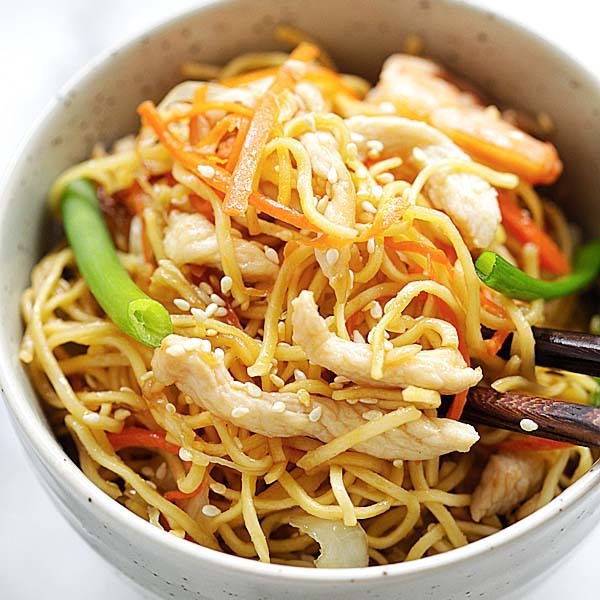 For a wholesome Chinese meal at home, I recommend the following recipes. 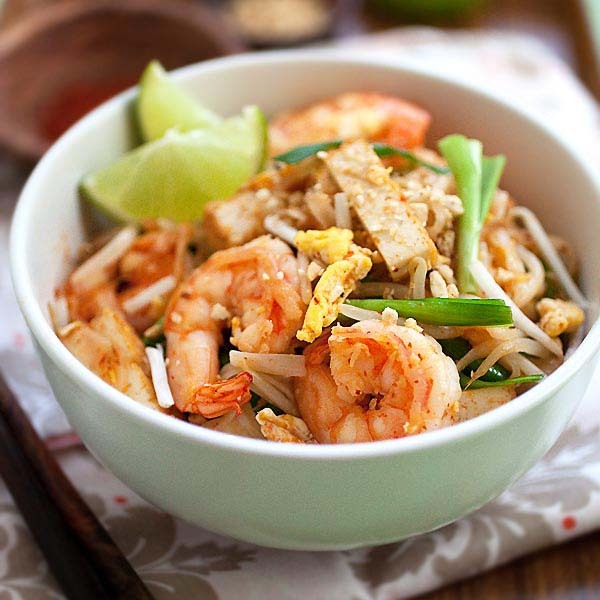 In a bowl, mix the ground pork, shrimp, soy sauce, sesame oil and white pepper together. Stir to combine well to form a sticky filling. To wrap the wontons, lay a piece of the wonton wrapper on your palm and add 1/2 tablespoon of the filling in the middle of the wrapper. (Use 1 teaspoon filling if you are a beginner.) Dip your index finger into the sealing water and trace it on the outer edges of the wonton wrapper. You can wrap the wontons three ways. To make a triangle, just fold it up to form a triangle. Pinch the edges to seal tight. To make them into the pretty shape (far left in the above picture), just pull the two corners of the triangle down so one overlaps the other, pinch and seal with water. To make them into Hong Kong style wonton (far right in the above picture), please watch my video at the top of this post. Heat up some oil for deep-frying. Once the oil is fully heated, deep fry the wontons until golden brown. Drain the excess oil with paper towels. 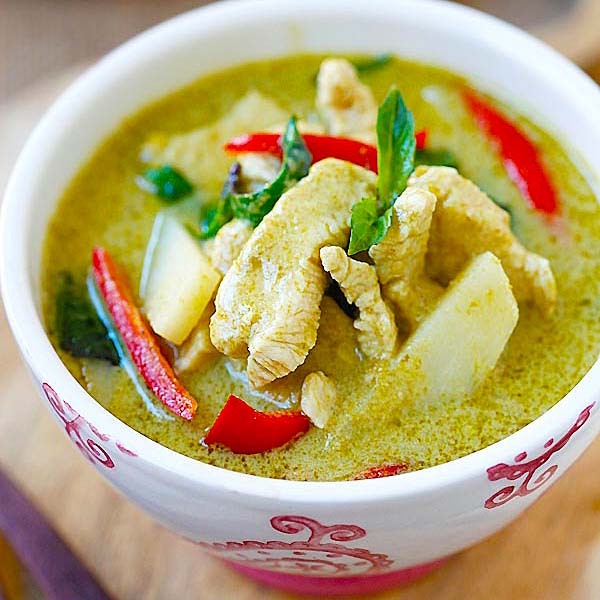 Serve hot with Chinese sweet and sour sauce or Thai sweet chili sauce. You can find my sweet and sour sauce recipe here. OMG, they look so delicious I am salivating like a mad cow. lovely blog you have here, really like the design. You are right Rasa Malaysia, they are “oh-so-beautiful!” Mmm.. The golden brown crust looks stunning and I can only imagine how the crunchiness of the water chestnuts makes the wontons taste delectable! Aileen – LOL. You should make your own so you can stop salivating. Tongue of Fury – thanks for your kind words and welcome to Rasa Malaysia. I checked out your site and it’s cool! Passionate Eater – That’s the fun of cooking; you make something so beautiful and then you eat them…very satisfying. YouTube is currently down so my video clip section is blank…do check back again and hopefully YouTube will be up and running soon! Yum. Fried wantons are delicious. I made loads early this year. The video is an excellent idea. When i posted a recipe on mine, i was worried that my description wouldn’t be clear to some people. Especially those who’ve never made them before. The visual presentation definitely hits the spot. You got mad skillz Bee! I’m constantly amazed. Very pretty wontons! Looks yummy too! TehSee – Mayo only works for shrimp wontons in my opinion. Paati – I checked out your blog and your biryani looks killer. Gotta try that but with chicken. WMW – Absolutely, they are the best snacks. Elmomonster – terima kasih banyak banyak! OMG! You really did bring the best out of Malaysian’s food. I am surprised that you are in Irvine as I am in Pomona (if you heard of it). Thanks for the tips and recepi.Your foods did bring my taste buds back to where I should belong..
Hi Min – thanks for your comment. Pomona is not too far away from Irvine, but I guess there is not a lot of Asian food there…you can always go to Rowland Heights, which isn’t too far away from Pomona. Rowland Heights? Arrghh… I am not very picky in food, but I am kinda picky when it comes to hygiene. Chinese restaurants over there ain’t too good in LA County ratings. If you wanna rate some Malaysian cuisine near by, I am not sure if you heard of “Penang” in West Covina. Not too bad but don’t bet on their Asam Laksa, it is horrible. Min – I think Rowland Heights restaurant are new and quite clean. Did you have bad experience there before? Penang in West Covina used to be very good, but now they changed their chef and owners so many times, it’s no longer good. Their Assam Laksa is the worst, like Chicken noodle soup. Some dim sum restaurants offer mayo to go with fried wontons but I think this kills the original taste. With water chestnuts in the wontons, they taste wonderfully sweet and crunchy. I like my wontons this way. If they are boiled, including a fresh prawn in each wonton increases one’s enjoyment to a fantastic level. You wrap those dumplings, girl! Tonixe – hmmm…wontons in pubs? Well have to check them out. Bayi – yep on the water chestnuts. Taking about boiling, I actually used the leftover skins and made some boiled shrimp wontons…stay tuned for my post soon! I’m wondering if these wontons can be wrapped a day earlier, refridgerated and fried the next day? Or..would it get soggy? Since peeling waterchestnuts are a killer (to me! )..I’m wondering if one can use turnips instead? This is a TFIT (thank god it’s there!) blog for me..especially since I’m chewing my fingers. Thank you! Mott – They would get soggy…I suggest you wrap the wontons on the same day you are going to deep fry them, preferably right after you wrap them. just found out your blog from your entry to DMBLGIT Nov 2006…you have a great blog & beautiful photos! But i love chinese very much and even my bf is chinese. Love ur blog… definately want to try the wonton for weekend with family since my grandma in town. Post in more recepi pls.. Love it! Beautiful post as usual. They remind sui mai and deep fried sui mai at that. They are gorgeous. This fried wontons reminds me of the good dim sum buffet back in Msia. I guess I can make this fried wonton using chicken right? what is bay scallops and where can I get them. Just in case, what the chinese name for it? Helen – Bay scallops are harvested from bay’s. Bay scallops are smaller, sweeter about the diameter of a dime to a quarter and are usually easier to find than their larger counterpart the sea scallop. Most scallops in your local grocerty store are Bay scallops. Love this! So artfully done! Looks yummy. Would like to try this recipe but need to know how many deep fried wontons does the recipe yield? Do you finish an entire package of wonton skins with the filling and is 1 tablespoon of filling per wonton just right? 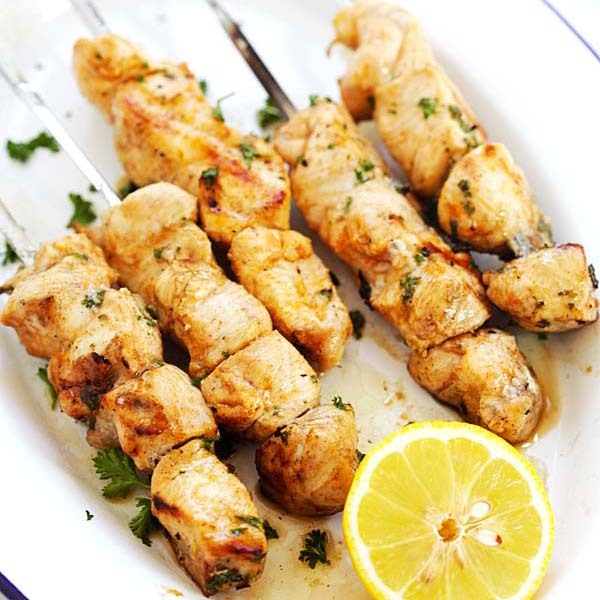 Thank you for all your delicious recipes – my entire family especially my two kids love your food! great recipes. it’s very crunchy, delicious, sweet & fragrance. thanks. may i ask can i use popiah skin or puff pastry to make other recipes but using same ingredients? Could I check if the coriander you used is chinese parsley? The wonton skin used is yellowish or white kind? if I were to subsitute the scallop with fish paste, do you think it will works? This kind of wonton is it better to deep fried? if pan fried, does it still works well? Hi Darren, thought I share this and hopefully it helps. You are right, it is Chinese parsley or Cilantro. Coriander is actually the seed which can be confusing if and when no picture is presented. Cilantro is widely used for ‘Chinese food’ and coriander for Asian food, such as Indian and Thai. Don’t know if you monitor posts this old, but…where’s that very helpful video you had on how to put together the won tons? I notice you had a note about YouTube being down in 2006, but I know I watched it more recently than that. I couldn’t find it either! Thanks for trying this fried wonton recipe. Hi.. Where do i go to download the video on how to wrap the wontons? And do you have the recipe on how to make the skin? Where’s the video for the wonton wrapping? Wow these look amazing! Is there a way to make these with rice wrappers instead of wonton wrappers? Several of my family members cannot eat wheat. Your recipe is very similar to the one I have been using since the 1970s, but the fish sauce looks like a terrific addition to my old standby. I love the idea of using the Thai sweet chili sauce for dipping–I’ve always hated that orangey stuff they serve in many restaurants, although I make an apricot sauce that is pretty good. My 8 yr old grandson likes the sweet and slightly spicy Thai chili sauce on everything from French fries to scrambled eggs to pork chops, and it’s a must for any sort of chicken. Love it. My Grandma used to make this for me when i was a little kid. I still remember those hot summer days, we were sweating all over in your streamed dresses. Long gone those days. Thank you for your recipe. It reminds a lot of thing. 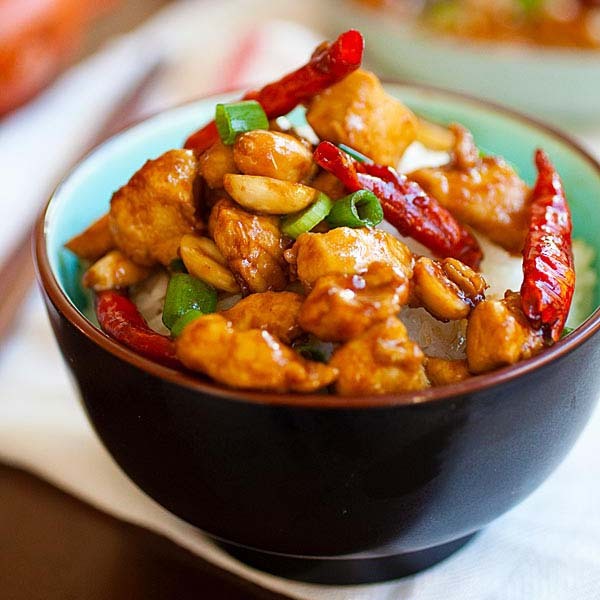 WOW these just made me DROOL .. (for real, not just saying that… I drooled on myself)- I love making this dish but your pictures and presentation is insane! LOVE IT! I did not have shrimp, I used a piece of flounder. I also added 8oz of cream cheese.OMG they were delicious! I could not make them fast enough before my family emptied the plate? These were delicious! Especially with BBQ sauce! Can I use an air fryer instead? If can, what do I need to do differently in order to get crispy wanton? It *might* work in an air fryer if they have a light coating of oil or nonstick spray to try to get them to brown and crisp. If you don’t want to deep fry because the oil content, then brushing them with oil will still defeat the purpose… but will retain far less oil than the deep fried version. I personally would try a couple lightly brushed with oil, and a couple sprayed with nonstick spray and see how it goes in the air fryer. Plan on pan fry/steam the rest if you don’t get good results. I usually make a large batch and pan fry/steam half, and deep fry the other. I like them both ways but the fried version makes better left overs. Keep up the superb work, I read few posts on this internet site and I conceive that your website is real interesting and contains lots of good info.